The author on his trusty horse. Children are expected to help out with work. Inside one of the yourts with a host. After five days of pounding hooves, Carragher, my shabby-haired attentive horse, wheezes heavily as he climbs the final 200 metres to the two white yurts that appear like beacons on the deserted green Kilemche mountain. An old woman pops her head from the yurt and beckons us forward; she’s the first person I’ve seen since breakfast. In this overwhelming and pervading sense of wilderness, a few scattered animals moseying on the mountain and a mountain river are the only signs of life as the sun disappears behind the mountains. The running water provides a welcome constant: without it there is nothing in the silence or landscape to suggest that time is moving forward. It’s a full day by horse to the nearest 4x4 track and much further to the closest village: welcome to the life of a nomadic shepherd. Kyrgyz shepherds spend the bitterly cold -30˚C winters in small villages before packing up their yurts and belongings and travelling for up to a week to set up camp in solitude in ‘jailoos’, flat grassy pastures in between Kyrgyzstan’s boundless mountains. Isolation is a crucial element of their survival; they must find a place with sufficient untouched grass to ensure their sheep and cows grow amply overweight. My seven-day trip is attempting to recreate their journey and travel to the most popular and famous of jailoos – Song Kul, a lake at 3,100 metres above sea level. 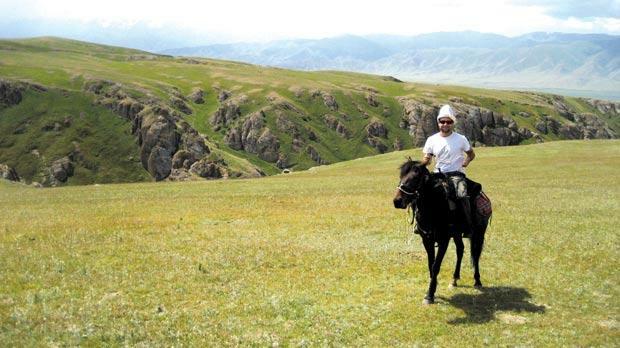 Of course, I’m doing it the easy way, just riding a horse, not herding over 1,000 sheep and cows over the mountain passes. Clear sky, sun burning, streams glittering, the first five days riding are perfect for a passenger, but Carragher struggles on the rocky terrain as the 1,000-metre-plus increases in altitude take their toll. As sweat seeps from his fur I realise I have no idea about horse petting etiquette. Spoil them and keep them happy? Or ensure they’re scared and follow every command? With snowy pinnacles peaking out in the distance, offering a postcard-perfect contrast to the verdant green valleys in the foreground, I’m blinded by beauty and opt to do nothing but let him plod his away along the narrow pass, with sheer 500-metre drops just one misplaced hoof away. 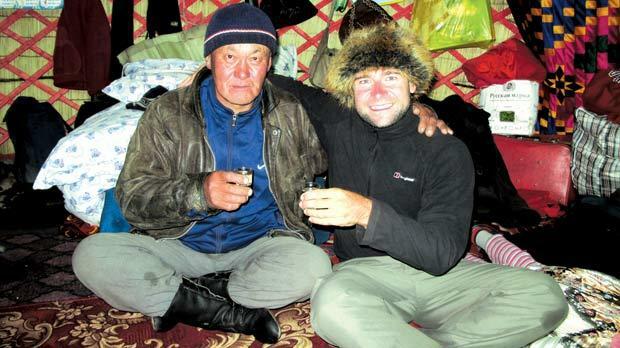 Each day culminates in a gallop across a jailoo to the yurt of a local shepherd. Community-Based Tour­ism has linked together a network of hosts in the silent mountains, ensuring additional income for local people and providing an authentic glimpse into nomadic life. After not seeing a motorised vehicle in the day, sleeping in a yurt surrounded by the squawk of chickens and baaing of sheep reinforces the legitimacy of the experience. And while it may lack running water and electricity, and half-consumed sheep carcasses dangle above the bed, it’s perfect if you value human interaction over air-con and a minibar. From walking age, Kyrgyz children are expected to play their part, and not once do I witness any dissatisfaction at been asked to work. Milking animals, wrestling goats, making and serving tea, cleaning pots, making beds, herding cattle: it is not until sundown when anyone gets a proper rest. It takes nine hours of difficult riding to reach the Kilemche mountain, but with their customary welcome, a hot pot of chai revives my spirits. The family’s 17-year-old daughter is given the job of staying in the room with us and attentively refilling our cups. After cooking dinner she doesn’t eat with us, but once again, serves attentively and responds to our every request. Leaving Kilemche early we head towards a steep pass, Carragher struggling with the incline and rocks, the crest offering spectacular views of the mountain passes we’ve crossed to reach this point, and our destination: Song Kul. Carragher’s excited and has to be held back, giddily bounding down the slope, the perfectly still lake growing larger, the mountains behind developing an imperiousness. I let him go, hooves pounding in the soft grass, ears pinned forward, my body shaking and falling from side to side, until we reach the yurts on the western shore and Carragher pulls up abruptly. The lake ensures the vitality of the large open grassy pastures, a continual supply of fresh water, and the opportunity to supplement a diet with fish. Tall, slim and with a smile that would break a million hearts, Beka would have suitors lining up in Europe. As it is, she seems to be being put through a wifery finishing school by her aunt, who teaches the finer points of cooking, serving, and smiling coyly at male guests. Am I being offered her niece? 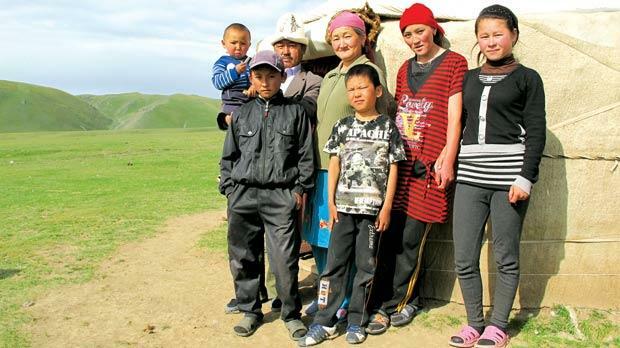 Kyrgyz women certainly have an inherent beauty and the nomadic life is alluring: The simplicity. The silence. A life surrounded by breathtaking natural beauty. It’s a tempting prospect. 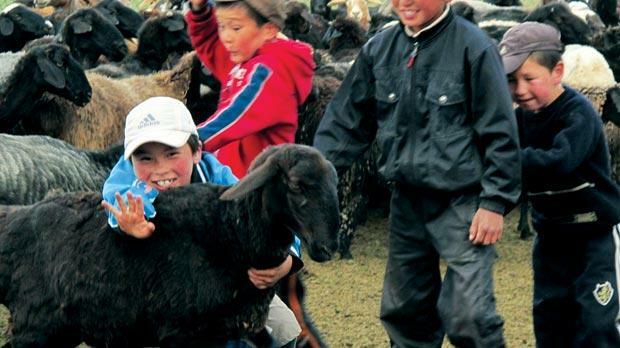 The past seven days have demonstrated that although living life as a nomadic shepherd may be something people are inescapably born into, it is a life they relish, and I’m confident they would choose it even if there was an abundance of alternatives. Heading back to the Kyrgyz capital of Bishkek there is only one thing in my mind: how long can I extend my visa for?